Acrylonitrile Butadiene Styrene (ABS) Market size generated over USD 22.3 billion for 2015 and will witness over 6.0% CAGR. Potential outlook in home appliances, automotive, electrical & electronics industry will propel the acrylonitrile butadiene styrene market. Increasing automotive production coupled with shifting automotive trends towards low-weight automobiles will support the business growth. Global automotive production is anticipated to exceed 100 million units by 2020. Stringent government regulations in North America and Europe have lowered emissions, reduction in weight by above 440 kilos, allowing usual 40 grams CO2 weight fall and a surge in fuel efficiency up to 11%. Appliances are the dominating application accounting for more than 30% of the 2015 acrylonitrile butadiene styrene market share. Upsurge in demand for ABS in China due to shifting income trends is the major driver of the industry growth. Increasing product penetration in several applications due to its design flexibility, light weight, chemical resistance, corrosion resistance, high strength & toughness and superior mechanical characteristics will fuel the revenue growth. Technological advancements in resins, high-durability, and temperature resistant material are the driving factors that enable product penetration. The penetration of innovative products with latest manufacturing techniques including halogen FR technology will enhance acrylonitrile butadiene styrene market size. Acrylonitrile butadiene styrene are widely utilized in plastic sheets, pipes and fittings. Growing construction spending in developing region due to increase in per capita disposable income is among the key factor for industry growth. Construction industry in Asia Pacific was valued at over USD 1,550 billion in 2015 and is forecast to witness CAGR at 5.0% by 2024. In 2012, India recorded, rise in government construction over USD 9.0 billion and overall spending was over 140 billion. ABS have witnessed increased substitution over conventional material in recent years due to its ease in fabrication and inexpensive properties. Reduction in steel usage in manufacturing industry owing to the requirement for enhanced visual appearance coupled with colour requirements from various end-users is among the major factors for acrylonitrile butadiene styrene market growth. ABS pricing is strongly dependent on its raw material. Increasing production capacity in the Asia Pacific region is a major factor in determining pricing trends. Moreover, increasing prices of benzene are among the factors for increasing the cost of styrene, ultimately resulting in an increase in the price of ABS. Strong demand from end-use and reduced raw material supply, such as styrene, are the major factors for increasing the pricing trend. In near future, regulations on non-biodegradable and non-renewable material may hamper acrylonitrile butadiene styrene industry growth. The global household appliances segment is expected to reach over USD 11.9 billion by 2020. This segment includes microwave ovens, dryers, and washing machines. Growing urbanization and increasing consumer spending on appliances are among the major factors for up surging the market demand. The property to retain its structure at higher and lower temperature has positively influenced ABS market penetration in cleaning and cooking appliances. Better electrical insulation is a notable property for increasing electrical and electronic applications of acrylonitrile butadiene styrene. It also provides high hardness and glossy surface and is used widely in various electrical appliances consisting television, printing, housing, and computers. Acrylonitrile butadiene styrene market size from automobile application is expected to witness a significant growth over 2,100 kilo tons by 2024. It is used in manufacturing various parts in passenger, commercial, and heavy vehicles, which include body panels, instrument panels, grills, bumpers, and interior parts. Increasing trend to decrease the automobile weight to increase fuel efficiency is a major driving factor for the automobile segment. In addition to this, increasing automobile production will further fuel the market growth. Depending upon the application requirement ABS is graded as high gloss, heat resistance, and scratch resistant. 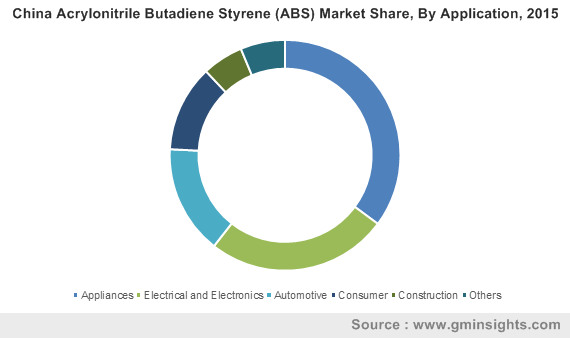 The U.S. acrylonitrile butadiene styrene market will generate over USD 3.1 billion by 2024 owing to the growing demand from the automobile industry coupled with electronic goods. The high demand from industries, such as chemical, polymer, and manufacturing, will result in growth in the industry. The recent shift in trend in production has resulted in decreasing the production capacity among manufacturers. This has resulted in an increasing the import from major manufacturing players. Product innovations in consumer product will drive the market demand. APAC, dominated by China and India market, generated over USD 6,600 kilo tons in 2015. 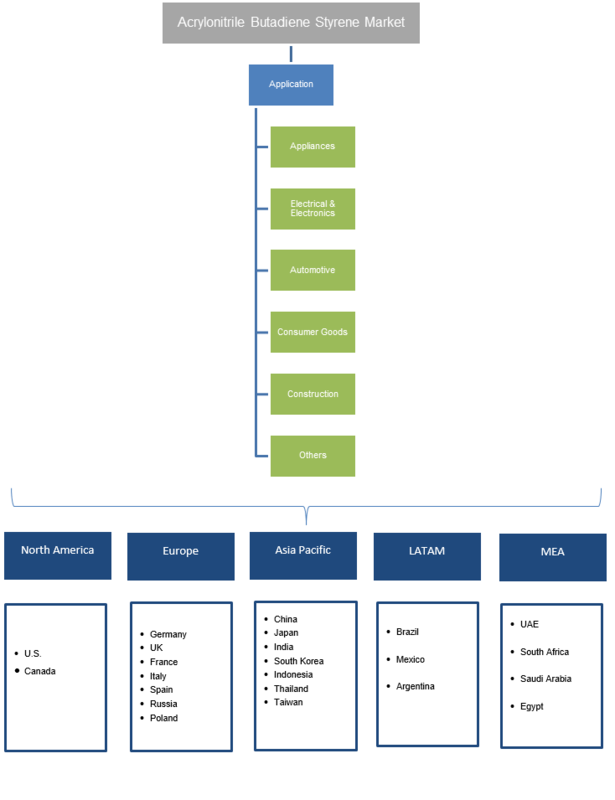 Asia Pacific is the major contributor of the industry accounting for more than 70% of the global acrylonitrile butadiene styrene market share in 2015. High application scope in automotive, construction, electrical & electronics, and consumer goods industry will drive the demand. Increasing capital investment, imports, exports, industrial output, and consumer consumption in China will open more opportunities for market growth. Europe acrylonitrile butadiene styrene market, led by Germany, France, UK, and Russia foreseen to witness gains at over 6.0% up to 2024. Europe is the major hub for the automobile industry with innovations and increased performance. Stringent regulations regarding decreasing automobile weight to reduce emissions are among the major factors for ABS market growth. The product is widely utilized in car exterior and interiors, owing to properties such as high glossy surface and scratch resistance. The European region is expected to show a steady growth in market followed by the Asia Pacific region owing to the growth in demand for consumer goods. Acrylonitrile butadiene styrene market share is highly concentrated with top five players accounting for major market share. Major players include Chi Mei, LG Chemicals, Styron, Kumho Petrochemical, INEOS Styrolution, Asahi Kasei, Sabic, China Petroleum and Chemical, Formosa plastic, Elix Polymers, BASF, Toray, Ampa, Rochling, Dow Chemicals, Polyone, Entec Polymers, Techno Polymers, Bayer, Mitsui Chemicals, RTP Engineering Plastics and Ravago Manufacturing Americas. Companies collaborate or partner for technical expertise and product development to compensate the increasing raw material prices. This strategy help companies in establishing themselves in the market for providing high-quality ABS to various companies. Acrylonitrile butadiene styrene industry includes large distribution channel because of large presence of traders and wholesalers for various applications including home appliances, automotive industry, construction and electrical & electronics. Acrylonitrile Butadiene Styrene can be formed by continuous mass or emulsion polymerization technique. It is a few-step process in which ABS rubber constituent is extracted in emulsion and later combined with styrene acrylonitrile on appropriate melt mixing masses include extruders. Over the past, acrylonitrile butadiene styrene market replaced various conventional materials including wood, metals, nylons and ceramics. ABS are formed using petrochemical compounds from various chemical reactions. It is produced by premium quality of raw materials include acrylonitrile, styrene and butadiene, in which SAN (Styrene acrylonitrile) content is around 75%. Due to is superior properties include chemical resistance, thermal, transparency, excellent process ability and good dimension stability.